Twenty years ago this week, a twenty-year-old Evangelical Christian and committed creationist – me! – began studying for his BA in Theology at King’s College London. This was during the time of Colin Gunton, Alan Torrance, Francis Watson, Douglas Farrow, Paul Helm, Graham Gould, Brian Horne, and Graham Stanton, among others. 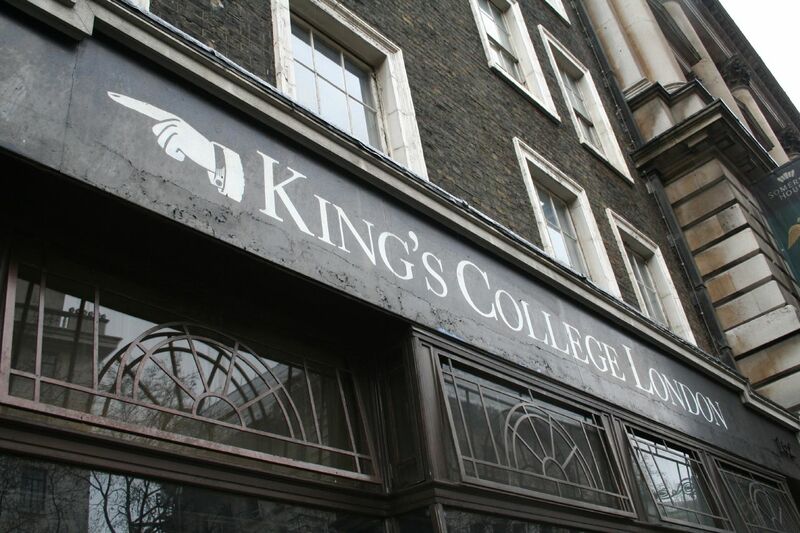 Starting to study at KCL was an eye-opening experience for me, not least because in that first year (1995–96), it became apparent to me how little I knew about my faith. But the Department of Theology & Religious Studies at KCL was the ideal place to ask questions without fear that one’s faith was going to be destroyed. Karl Barth. Straight from the first lecture (which, if I recall correctly, was delivered by Douglas Farrow), we were advised – nay, instructed – to buy and read Barth’s Dogmatics in Outline. I’d already become fairly familiar with Barth’s thought through reading the first edition of Alister McGrath’s Christian Theology: An Introduction during my ‘A’ levels, but this was the first time I’d actually been required to wrestle with Barth directly. The Bible. Again, in that first lecture, Douglas Farrow stressed the importance of needing to read the Bible on a regular basis, if only because it was the primary source for the people and ideas we’d study. Relativism and the Holocaust. In one lecture, Douglas Farrow and Alan Torrance undermined the foundations of one student’s apparent advocacy of relativism by asking him if Nazi Germany was right to oversee the Holocaust. Occasionalism. I was strongly influenced by Descartes and Bertrand Russell during my ‘A’ levels, and so I thought Paul Helm needed to know I was an occasionalist. Let’s just say that I’m no longer an occasionalist. Girl Trouble. Does anyone get through university without experiencing problems with their love life (or lack thereof)? Douglas Farrow noticed that I seemed a little low during parts of that first year and offered me a sympathetic ear. Good tutors aren’t just concerned with the academic side of things . . . Academic Rigour. . . . but having said that, Douglas Farrow (that name again) made it quite clear to me that rehashing my ‘A’ level notes on Luke’s Gospel was unacceptable. SPCK had a magnificent shop opposite Great Portland Street station. I spent a lot of money there, and I even read some of the books I bought. PhDs Not Necessary. My memories may be faulty here (so I’m happy to be corrected), but I believe Alan Torrance was still Mr Torrance when I started at KCL (though he was soon ‘doctored’); and Peter Byrne, though Professor in the Philosophy of Religion, did not have a PhD. I suspect it’s almost impossible these days to teach at university level without already possessing one. Friends. Coming from an Evangelicalism that stressed the need for individual salvation, I was at times both persuaded and perplexed by what was almost a KCL TRS mantra of ‘unity in diversity’. But I did find value in discussing our lectures with my fellow students on the coffee-stained sofas (I hope they were coffee stains) of the lounge known as GO1. And I’m still good friends with most of these people. Studying theology at KCL really seemed to emphasise and even require close-knit friendships and (a phrase I came to loathe) ‘networks of relationships’. Disruptive Behaviour. I was a couple of years older than most of my new friends, but that didn’t stop us all from drawing silly pictures in our notebooks or on other pieces of paper. (I still have a copy of an NRSV Bible where one of my friends changed ‘Luke’ to ‘Puke’. Ho, ho.) One day, Brian Horne reproached us for our lack of concentration during lectures . . . Ah, happy days. Haemorrhoids. Martin Stone, one of the Philosophy of Religion lecturers, advised me that sitting on a cold floor (as I was when he told me) would give me piles. Beard. Alan Torrance had a neatly trimmed beard! Given more time, I’m sure I could remember far more things from studying at KCL – and, let me remind you, this is just during my first year, 1995–96. (The lack of reference to Colin Gunton, now one of my theological heroes and inspirations, is simply because I don’t recall having any lectures with him until at least the following academic year.) I do have some regrets: I should have applied myself more – but surely university, or studying at undergraduate level, is not just about learning how to think but learning how to live as well. Also, I wish I’d recognised the quality of the faculty at the time; it was only after I graduated that I began to appreciate where and under whom I’d studied. But I suspect at undergraduate level, the main task is to obtain a good first degree rather than learn about the politics (I’m not using this word pejoratively here) of academia. And in the mid-to-late 1990s, KCL was arguably the best place to do this. Ah, you've exposed my greatest regret in life. I hang my head in shame. But surely your abiding memory of that year (or at least of its second half) would have been the almost ridiculously gifted and anointed worship leader at KCLCU... ? I had no idea you'd started college life as a committed creationist. What happened? I started that year an enthusiastic recent re-convert into charismatic evangelical Anglicanism. So I was bewildered but excited by the broad spectrum of Christianity I encountered in the KCL Chaplaincy (I loved informal communions with Fr Tim) and in AKC sessions (which introduced me to some liberatingly liberal ideas),.. and also in getting to know you Theology students, who to me were an exalted and slightly subversive group. Plus you were all just very funny. I know we Theology students were slightly subversive, at least when compared to the rest of the CU . . . but exalted? I thought the rest of the CU hated (most of) us! Agreed on Martin Smith. You were a creationist, I was a Smith-ist - we both changed. Though I still have a grudging residual affection for a few of those songs (or snogs as I just mis-keyed). I don't know how the rest of the CU regarded you Theology types, though I can imagine that some may not have warmly appreciated all your antics or views... but I know I for one looked up to you all as founts of wisdom and silly jokes. Well, the fount of wisdom has dried up . . . but the silly jokes keep on flowin'. My overwhelming contribution to Theology during this time was noticing the striking similarity between Karl Barth and Shaun Ryder from the Happy Mondays. Theology still owes me a huge debt of gratitude for that gem. (Assuming this is Lord Shrimpor) I thought you made the Ship-of-Fools-validated comparison between John Calvin and Shaun Ryder . . . Yes, he made the comparison and sent it by e-mail to Ship Of Fools, but he sent it UNDER MY NAME. Unfortunately for him, the powers that be loved the e-mail and thus began the Born Twice section of the website. And I got credit. Ah, not my intention, of course. But your post is very timely for me. Thank you. No, thank *you* - I got some 'stuff' off my chest, which is always a good thing, so I'm glad it did prompt me.